Each sconces features two lighted arms which form an asymmetrical pattern. Made of gilded bronze with polished brass bulbs sockets. Their design can be qualified as an elegant brutalism. 2 bulbs per sconces. Set of 3 Felix Agostini wall lights sconces golden bronze. Pair of three light bronze sconces. 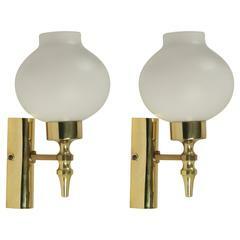 Pair of wall sconces "Arcturus" model. Alabaster shade in a silvery bronze frame. Signed. Bronze with greyish green patina and red lampshade. Signed.